If you are somewhat familiar with Japan, you might know that this time of year is considered the "rainy season". It's not that cold, but sometimes days will pass before the sun comes out. 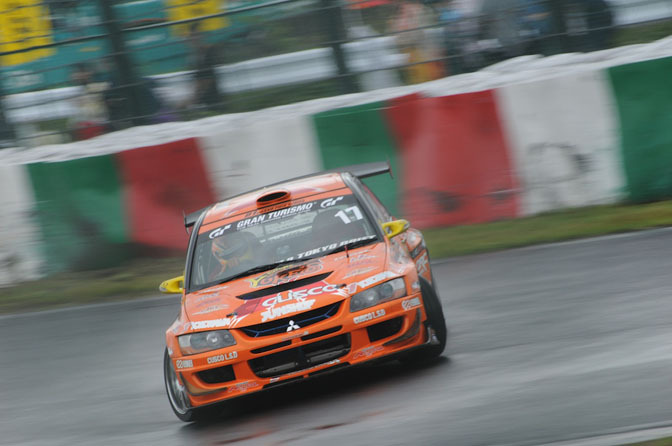 The rain was falling hard at Suzuka Circuit this weekend where the third round of this year's D1 Grand Prix was being held. 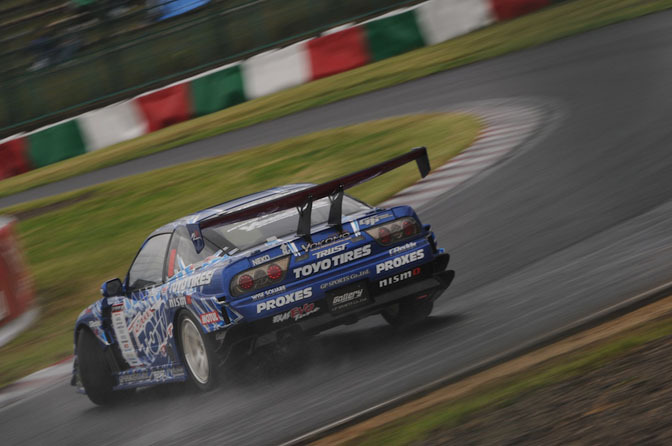 Of course, a little wetness wouldn't stop the top D1 drivers from pushing their cars to the limit and beyond. 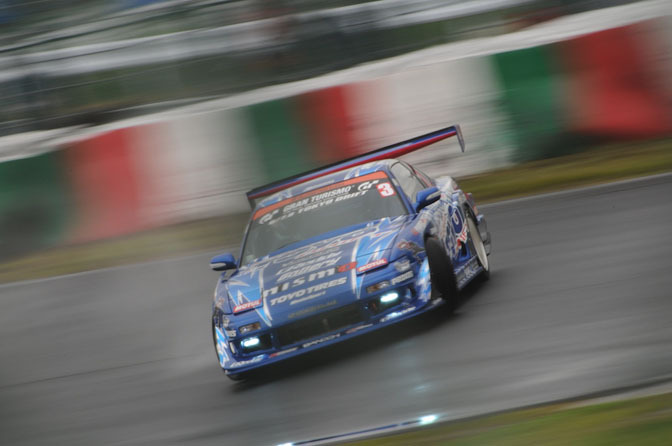 One my Flickr friends in Japan, scivi, braved the ugly weather to grab some photos at the event. Anyone who has ever tried to photograph racing in the rain knows that all the water, and lack of light can make for quite a frustrating experience. He still managed to get some great shots. Kumakubo looking good in the Evo 9. 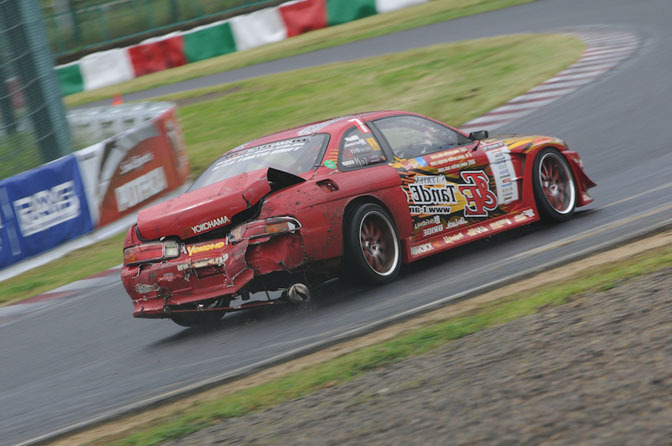 Last year's champion Kawabata has switched to 180SX for this season. The GP Sports aero is as aggressive as it gets. 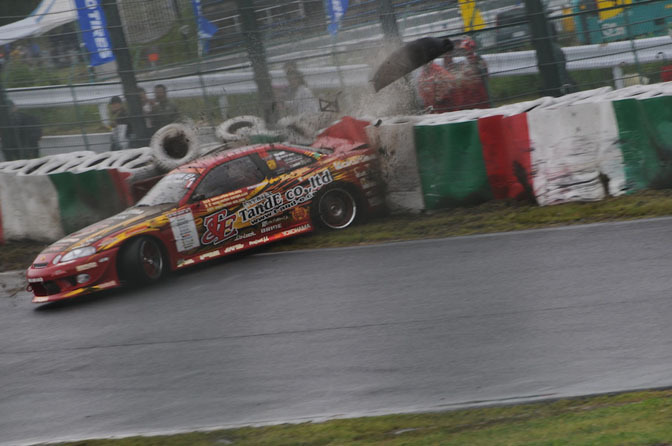 The rain claims a victim as Takahiro Ueno's JZZ30 Soarer hits the wall going backwards. Looks like it was pretty hard hit. Check out the GT wing flying off the car! Great timing on the photo. Not too much remains of the car's rear end. Ouch. Luckily for the drivers and fans, the weather cleared up for the later half the event. I'm happy for Tezuka it has been a long time coming for him. Didn't he do some vinyl designs for a bnr34 for origin? It was a shade lighter than a "Top Secret" gold with what I think were Work rims. @ Bryn, your Tafftune right?